David Richins has a degree in linguistics from BYU. He has lived most of his life in Ohio. He authors a fascinating blog on Mormon topics entitled "The Lunch is Free" which is a nod to a famous essay by Hugh Nibley entitled "Work We Must, But the Lunch is Free." I find Richins' work on Book of Mormon etymologies insightful and highly creative. He corroborates and extends the impressive work Robert F. Smith, Paul Y. Hoskisson, Stephen D. Ricks, and John Gee have done in their Book of Mormon Onomasticon. Richins delights at finding wordplay in the text as does Matthew L. Bowen whose prolific contributions in Interpreter are defining a new sub-discipline within Book of Mormon Studies (see for example "Father is a Man: The Remarkable Mention of the Name Abish in Alma 19:16 and its Narrative Context" and "Onomastic Wordplay on Joseph and Benjamin and Gezera Shawa in the Book of Mormon"). I planned on joining Warren Aston and his 2016 Ramah/Cumorah Expedition for the Tuxtlas portion of their exploration. Then a family tragedy struck and I stayed home. Wishing to contribute to the effort, I wrote the article Ramah/Cumorah which was of some use to the team in the field. 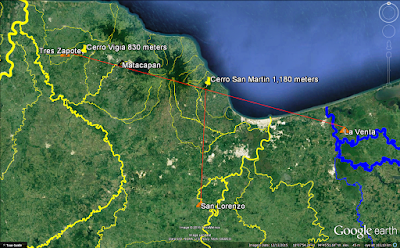 I concluded in that article that Cerro San Martin was the most likely candidate for hill Ramah/Cumorah. Aston emailed me upon his return to Brisbane and indicated that locals call the hill San Martin Pajapan. Searching on that name led me to this remarkable article David Richins posted on September 5, 2016 "Fire Within, The True Meaning of Cumorah." Through methodical and far-reaching linguistic analysis, Richins comes to the same conclusion that San Martin Pajapan is a likely candidate for Ramah/Cumorah. Our efforts were entirely independent and our methods highly dissimilar, but we both ended up in the same place. Perhaps we are on to something. The Olmecs revered San Martin Pajapan as the place of original creation, a notion that persisted through Aztec times as documented in Bernardino de Sahagun's "La Historia Universal de las Cosas de Nueva Espana" now commonly called the "Florentine Codex" because the best preserved original is in the Laurentian Library in Florence. From ca. 1,000 BC to AD 1968 San Martin Pajapan Monument 1 stood atop the summit with a cache of jade objects buried directly beneath it. This colossal effigy depicts the rain god in an elaborate headdress raising a world tree. The sculpture stands 1.4 meters high and weighs more than a ton. Iconongraphy includes crosses representing the four cardinal directions, four quarters of the earth, and the center (see the article entitled "Four Sides, Four Quarters, and a Center") and an early depiction of the bird/serpent motif best known from later images of the Central Mexican deity Quetzalcoatl. 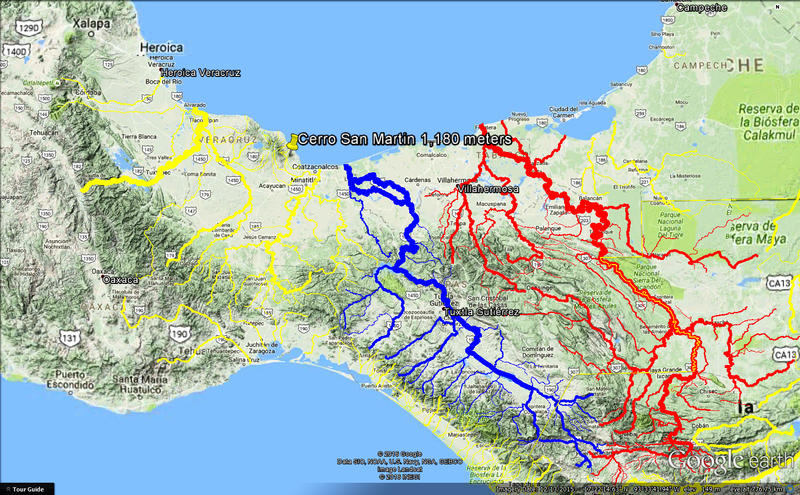 The three most important Olmec sites: San Lorenzo, La Venta, and Tres Zapotes are precisely equi-distant from San Martin Pajapan. On a clear day, one can see San Martin Pajapan from San Lorenzo. Not so from La Venta which has no mountains visible on its horizon. 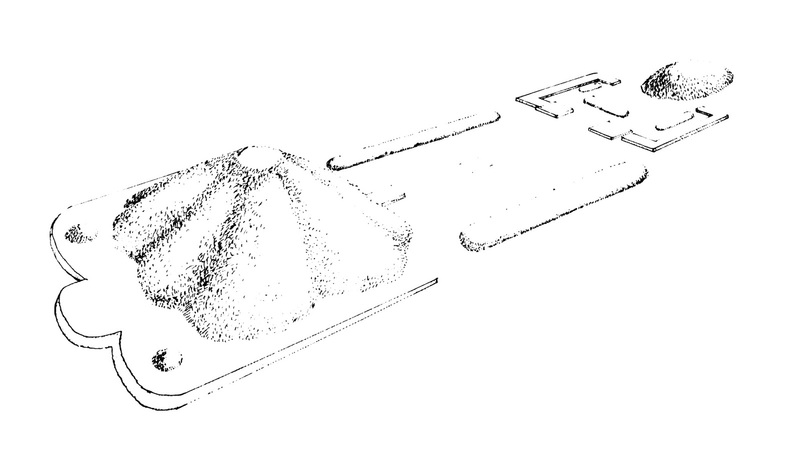 So, the later Olmecs who built La Venta created an artificial mountain, a pyramid with fluted sides consciously imitating the conical shape of dormant volcano San Martin Pajapan. 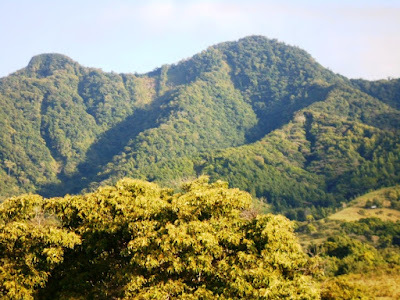 A transect between Tres Zapotes and La Venta bisects both Cerro Vigia and Cerro San Martin Pajapan. 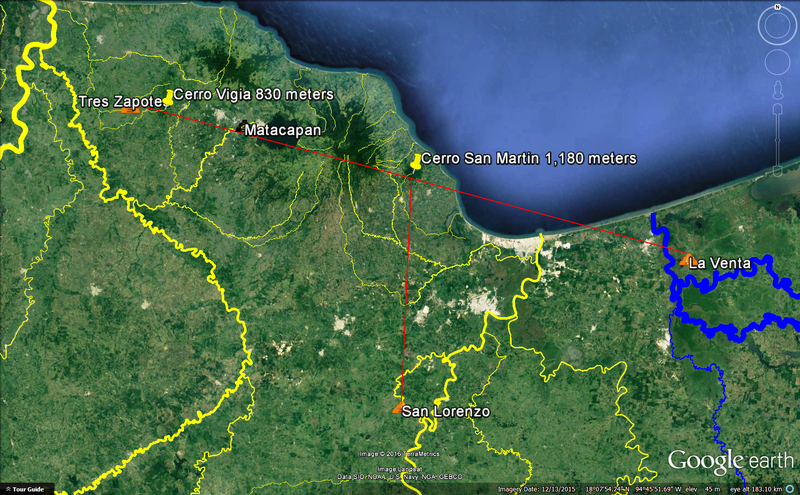 San Lorenzo is roughly at right angles to this transect. Why did Mormon move the Nephite record archive from hill Shim to hill Cumorah against Ammaron's explicit command to leave the repository where he hid it Mormon 1:4? 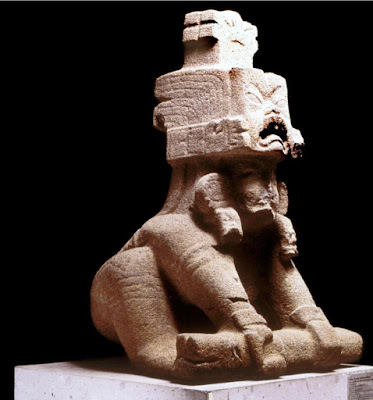 With the alliance between Matacapan & Teotihuacan, the Nephites no longer controlled the area around hill Shim. Why did Mormon believe the Nephite records would be more secure in hill Cumorah Mormon 6:6? Cumorah was widely revered as a sacred place, unlikely to be disturbed. San Martin Pajapan Monument 1 stood for nearly 3,000 years before modern archaeologists removed it to the museum in Xalapa. Why did Mormon choose Cumorah as the place for the final battle Mormon 6:2? Stories of the Jaredite demise could have been motivational to his people and de-motivational to the Lamanites. Some Lamanites may have refused to fight in a place many regarded as holy. Cerro San Martin, aka San Martin Pajapan, was a very important place to the Olmec. Ramah/Cumorah was highly significant in Jaredite and later Nephite affairs. Further research is warranted. Here is a photo of San Martin Pajapan Warren Aston took on his recent Ramah/Cumorah 2016 expedition. And this is an aerial view from the Gulf of Campeche coast. 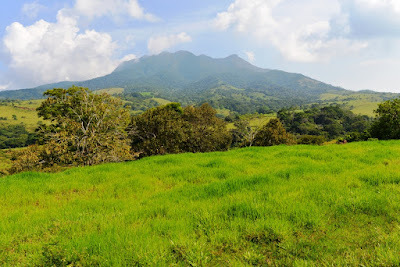 The Santa Marta aka Martha Mountains are visible in background. 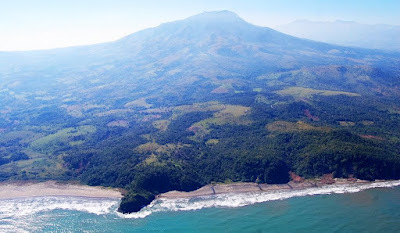 View of the San Martin Pajapan summit. Cerro Vigia was the source of some of the boulders the Olmecs used to carve their colossal statues, including stone heads. 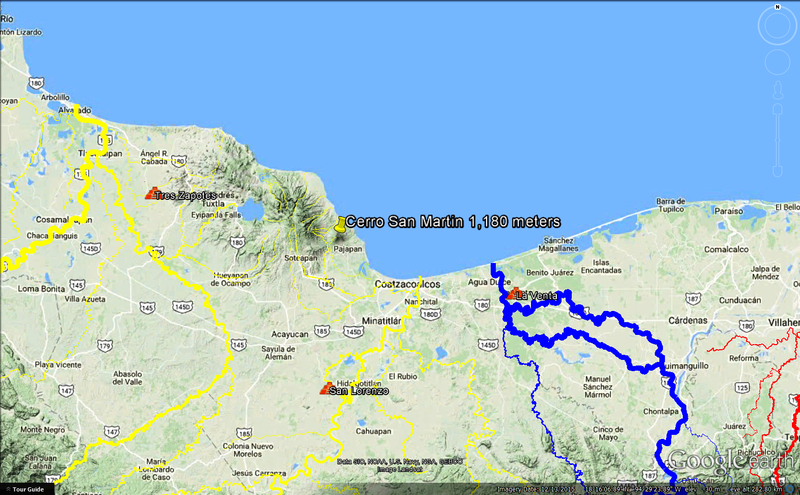 Another source was Cerro Mono Blanco 24 kilometers east of Cerro Vigia and 3 kilometers NNW of the town of Catemaco. Cerro Mono Blanco is strongly associated with witchcraft in contemporary Mexico. Mormon decried occult practices Mormon 1:19, Mormon 2:10. At least 40 extinct volcanoes in the Tuxtlas have crater lakes. There are many springs and some spectacular waterfalls. These may be part of the many waters Mormon described Mosiah 8:8, Mormon 6:4. The natives hunt, fish, and farm. The presence of all three forms of subsistence may have been part of the advantage Mormon hoped to achieve in the area Mormon 6:4. These volcanic mountains are full of caves. Ether's cavity of a rock Ether 13:13-22 may have been a lava tube or collapsed lava tube. Many natives are herbal healers recalling Alma 46:40. Natives gather honey on the slopes of San Martin Pajapan. The Book of Mormon mentions honey among the Jaredites Ether 2:3. Natives fear a bad wind as in Mosiah 7:31. The four cardinal directions are central to the local worldview as they were in the Book of Mormon Mosiah 27:6. Article updated November 28, 2016.